LOCATION This rarely available family home is ideally located within an ultra-convenient position, only a short walk from Horsham’s historic town centre with its plethora of restaurants and coffee shops, together excellent shopping facilities, that include John Lewis at Home store & Waitrose. The property is also perfectly positioned, in a picturesque location accessed via the historic Causeway. The house is also within a short walk of St Mary’s Church of England primary school and conveniently positioned for both Millais & Forest secondary schools, along with Horsham mainline station with its direct service to London Victoria in around an hour. PROPERTY An incredibly rare opportunity has arisen to purchase this fantastic detached residence situated in a delightful cul de sac in central Horsham with the town centre being just a stone’s throw away. The current owners have resided at the property since it was built in 1968 and have excellently maintained the property throughout this time. Whilst the property is dated, there is opportunity to put your own stamp on this spacious and well located property in addition to enlarging the property further, subject to planning. Offering excellent size rooms throughout the accommodation comprises: entrance hall, cloakroom, wet room, kitchen, utility room, dining room, lounge and conservatory to the ground floor. To the first floor and arranged around a large, naturally lit landing with large window to the front are four great size bedrooms and family bathroom. Back in 1998 the owners had plans to extend the property into the vast loft. 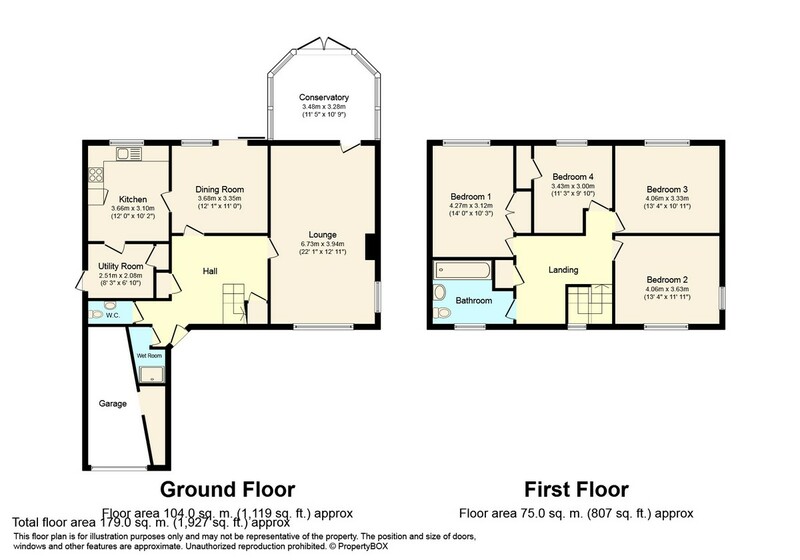 Features of the property include Parquet flooring throughout the ground floor, large windows flooding the house with natural light and no onward chain. OUTSIDE The rear garden offers a fantastic degree of seclusion with mature trees, hedging and shrub borders. Mainly laid to lawn with patio area adjacent to the house, the garden, like the house, has been lovingly maintained throughout the ownership. To the front are further gardens with driveway parking leading to the integral garage with up and over door. There is also side access to the rear garden.